As promised in my previous post, in this post I will tell a little bit more about workspaces. When creating a new workspace (and I explained why you need to do that in my previous post) or editing an existing one, the dialog pops up. In 2012 it shows a small one. Press the “Advanced” Button to expand. I like to walk through the different fields that are shown here and what they mean and how to use them. The name of the workspace. This is unique per User and Computer. It is wise to have some kind of naming convention for workspaces that you use for all users and projects. I usually use WS_PROJECTNAME_USERNAME_COMPUTERNAME. I do this because I want to know where I am looking at without having to dive into details. So when I view all my workspaces (also remote workspaces) I can directly see on which computer this is. I put my username in, because for the TFS administrator (and that is usually me) it is also good to see to whom the workspace belongs. This setting is new in TFS 2012. The choice is Current (the default) or Check-in. When you choose Check-in, the file modify time is set to check-in time. So if you check-in files that you changed 3 days ago, the file time in TFS is now ! 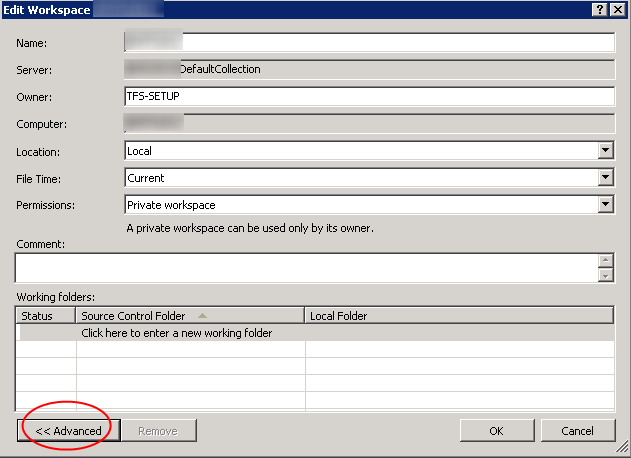 This is working with Public Workspaces in TFS 2012. After I make my Workspace as “Public” and when other team member checked out a file for Edit, TFS shows my name against the “User” column in Source control explorer. I expect to be his name to appear otherwise there will be a confusion that who checked-out, right? Can you please provide an answer for this? Rene, would you happen to know if workspaces generated by TFS Build (2013 in my case) could take up a lot of space in the TFS_DefaultCollection database? I just received some information that at my current project the database seems to be growing with almost 2GB a day and I am not yet able to explain that. One thing that I did notice is that there are hundreds of workspaces created by the build-service account for each of the projects that are being built. Not sure what is the impact of that, but should I perhaps include a “destroy workspace” activity at the end of each build? What would be the use of keeping those workspaces anyway? Thanks in advance for your advice in this matter. A workspace registration in the collection database is merely a record. I cannot imagine that will take up 2Gb per day. The build generates a lot of output, and when you have a lot of workspaces created by build, that means you have a lot of build output as well. The build output IS stored in TFS as XML and takes up a lot of space. In your build definition you can choose to delete everything in a workspace or to only get latest version. Build creates a workspace and reuses that because it is faster. So I would look for the cuase which builds are createing workspaces and why do they not reuse a workspace. Then you can look into the number of builds and the output generated..